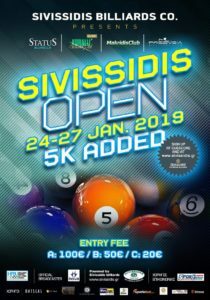 Sivissidis 9ball Open 24-27/01/2019 – Sivissidis Bros.
Sivissidis Billiards company announces the Billiards Sivissidis Open 2019 ! 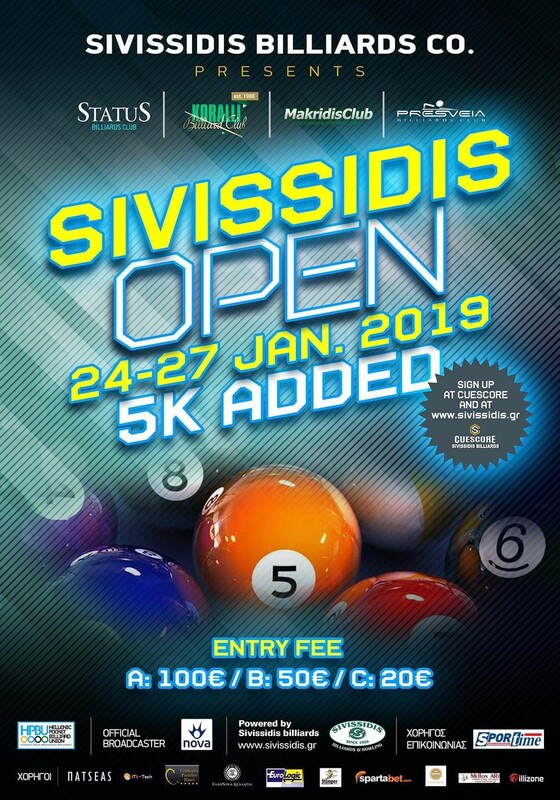 A new 9ball open tournament which takes place in collaboration with Nova Greece, and four (4) billiard clubs in Athens city – “Status”, “Koralli”, “Makridis” & “Presveia”. Guaranteed prizes of 5.000 euro added to the entries. Participation is open to all! The tournament will take place January 24th through 27th, 2019. Unlike similar events, the games will run silmutaneously in all four athenian clubs, with TV broadcast cover by ΝOVA (Official Broadcaster). The tournament will take place under the umbrella of the Hellenic Pocket Billiard Union (HPBU). Draw – schedule: 21/1/19 – 20:00 Athens time. Entry fee per division: “A”: 100€ – “B”: 50€ – “C”: 20€. Pay at site to each tournament director.